Are there physical traces of the gas chamber buildings at the Operation Reinhard camps of Treblinka, Sobibor, and Belzec? No physical traces of gas chambers can be found at the Operation Reinhard camps; therefore, they did not exist. Although little physical evidence remains of the gas chambers at Treblinka, Belzec, and Sobibor, photographic evidence, including aerial photographs, reveals much about the physical layout of the camps, including their buildings and gas chambers. There is physical evidence for the general layout of the camp and specific evidence for the existence of the gas chambers. This evidence includes photographs taken by the perpetrators during the camp’s existence and an aerial photograph taken six months after the camp was razed to the ground and closed. Kurt Franz’s photograph collection is a particularly famous example. Locating the gas chamber buildings in the death camp area of Treblinka on aerial photographs. Most of the buildings at Treblinka, including the gas chambers, were designed to be temporary constructions. The gas chambers were made of brick, wood, and concrete and had shallow foundations. When the Germans razed the camp, they tore down the above ground structures and even bulldozed the traces of the foundation walls and concrete floors. There is little evidence left on the surface. Only very purposeful and extensive digging reveals the evidence of the camps. However, Alex Bay, using sophisticated computer and mathematical analysis, has reconstructed a three-dimensional portrait of Treblinka. For his model, he used a 1944 aerial reconnaissance photograph and Kurt Franz’s photograph collection. On the aerial photograph, Bay found the visible scar of the “tube” that led from the reception area, where the Jews were unloaded and forced to undress, to the gas chamber buildings. The traces of the “tube” are marked by the clear presence of the fence posts that lined it. Although Bay was unable to find definitive traces of the gas chamber buildings on the images, it seems reasonable to conclude that they were close to the end of the tube (in the area marked with an ‘X’). Corroborating evidence of the aerial image and Franz’s photographs. When Bay examined Franz’s photographs, he found an image of the excavators in the area of the mass graves. These same photos featured partial views of both the smaller and larger gas chamber buildings. Particularly visible in the image is the end of the older, smaller gas chamber building, as well as the room in which the engine was installed. Also visible, but partially blocked by the excavator, is the western end of the newer, larger gas chamber building. The photograph also shows a well house, a fence that shielded the view of the mass graves area, a gate and two prisoners carrying a stretcher—all details whose existence and location are corroborated by both survivor and perpetrator eyewitnesses. By Unknown, overlay legend in Photoshop by Poeticbent, via Wikimedia Commons. Original from the National Archives Air Photo library at Alexandria, Virginia, U.S.A. Cartographic Division (Record Group 373). There is survivor eyewitness testimony about the location of the gas chambers. Yankiel Wiernik, a survivor of Treblinka, was forced to participate in building the newer, larger gas chambers. Wiernik described and located the “tube,” the old gas chamber, and the new gas chamber in a model he constructed in the 1950s. This model is now in display in Israel. 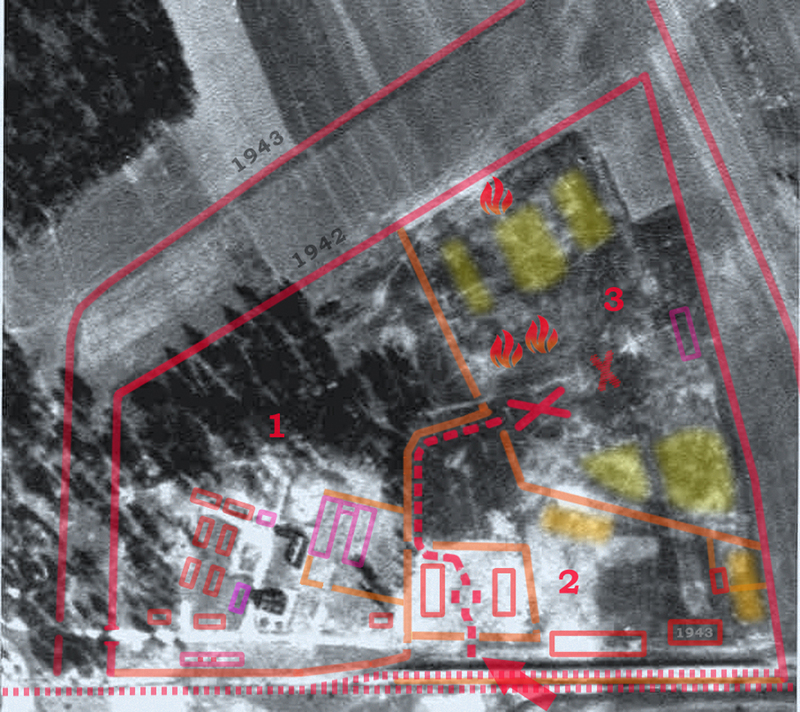 Without any knowledge of the 1944 aerial photograph, Wiernik places the “tube” and both gas chamber buildings in the location indicated by the scars in the aerial photograph. Further, without any knowledge of Franz’s photographs, Wiernik correctly reconstructed similar-looking buildings including the exact roof line of the new gas chamber building, which is a staple featured in Franz’s photographs. These photographs were not found until the 1960s. Each of these sources corroborate the others. At the time I began working in the death camp, there were two gassing structures in operation. The larger one had ten chambers, into each of which as many as four hundred people could enter. Each chamber was 7 metres long by 7 metres wide [23 feet by 23 feet]. People were stuffed into them in like herrings. When one chamber was full, the second one was opened, and so on. Small transports were brought to the smaller structure, which had three gas chambers, each of which could hold 450 to 500 persons. Franz’s photographs, the 1944 aerial image, and Wiernik’s model confirm the location of the “tube” and the two buildings at the end of it. Wiernik built his model in the 1950s when his memory was fresh. In addition, the architectural features of his model buildings are consistent with the features of the gas chamber buildings in Franz’s photographs (not found until the 1960s). These three pieces of evidence, when taken together, persuasively prove that the gas chamber buildings at Treblinka existed and that their general location has been identified. Carlo Mattogno and Jürgen Graf, Treblinka: Extermination Camp or Transit Camp? (Theses & Dissertations Press, 2004), 301 at http://vho.org/dl/ENG/t.pdf. Ernst Klee, Willi Dressen, and Volker Reiss, editors. “The Good Old Days” The Holocaust as Seen by Its Perpetrators and Bystanders (Free Press, 1998), 225-227, 245, 246, 248. See also “Kurt Franz” at http://en.wikipedia.org/wiki/Kurt_Franz. Alex Bay, “The Reconstruction of Treblinka at https://archive.org/details/TheReconstructionOfTreblinka. Alex Bay, “The Reconstruction of Treblinka” at https://archive.org/details/TheReconstructionOfTreblinka. See figures 36 and 37. 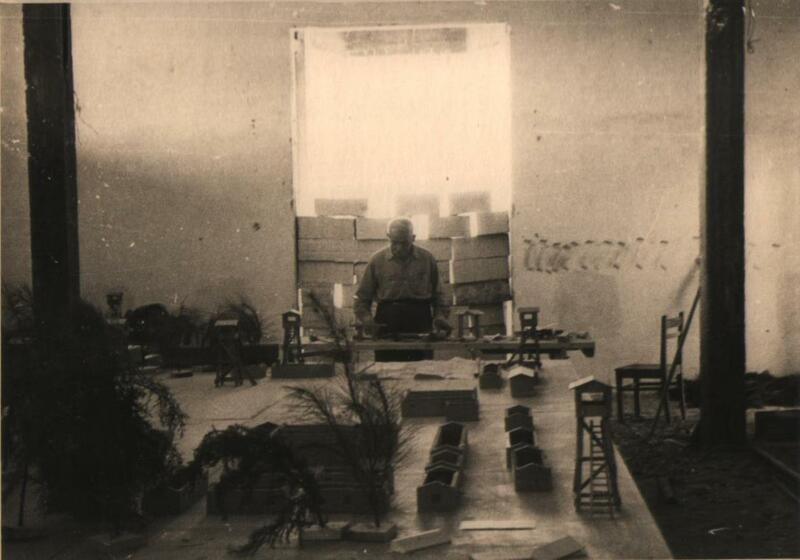 You may see photographs of Wiernik’s model in “A Year in Treblinka” at http://www.zchor.org/treblink/wiernik.htm and http://www.forward.com/articles/104670/.